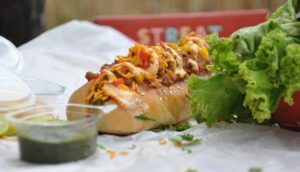 Streat Food Truck: Drive down this street to gobble fusion food with a desi twist!! Well, you have got to be living under a rock if you haven’t heard of this place yet. 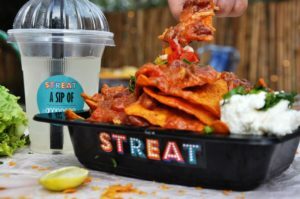 The latest food truck to hit the streets of Ludhiana, Streat serves some finger lickin’ good fusion food with just the right amount of desiness, all in a cute and vibrant truck. The smart use of wordplay in the name ‘StrEat’ has helped garner it a lot of attention and true to its name it is parked at one of the most frequented streets of the city. Our Recommendation – Creamy Mushroom Bun, Mediterranean Veggie Delight and Beans Mexicana. Taking inspiration from street food (pretty evident from the name, duh!) and international cuisine, the menu presents the best of both worlds. If you are a non-vegetarian, this is your new hangout place. Our recommendation– Keema Dawg (dhabe wala keema in a hot dog), Kadhai Seekh Foccacia (seekh kabab, egg bhurji in grilled focaccia) and Kukkad Kamal Da (butter chicken with Warqi parantha and Lacha). Give the regular aerated beverages a rest and try the refreshing Masala Lemonade and Dhaba Chai. Trust us when we say this – you will keep going back for more. If you go through the menu you will realise that sauces – Mayo, Baja, chilly, salsa et al play a major role in all the dishes. Here lies the best part – all the sauces are made fresh in house by the chefs. The food packaging is winning hearts all over the city. 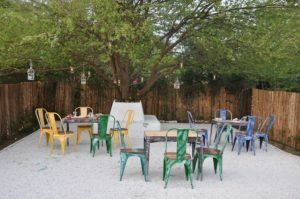 The seating space is set out in the open, an eclectic mix of colourful wrought iron stools and couches. Streat provides free home delivery till a radius of 3 kms (an extra charge of Rs 50 applies after that), the minimum order being Rs. 500. You can even avail their catering services for both indoor and outdoor parties. Expect to wait 15-20 minutes for your order, so keep your playlist ready. Check out their Facebook for regular updates.